Blog - Exploring Summer Pattern with Royal Crown Derby. Exploring Summer Pattern with Royal Crown Derby. Summer is a wonderfully colourful season with bursts of sunshine and floral blooms making it a beautifully bright season, perfect to inspire stunning pattern design for your luxury dining experience. 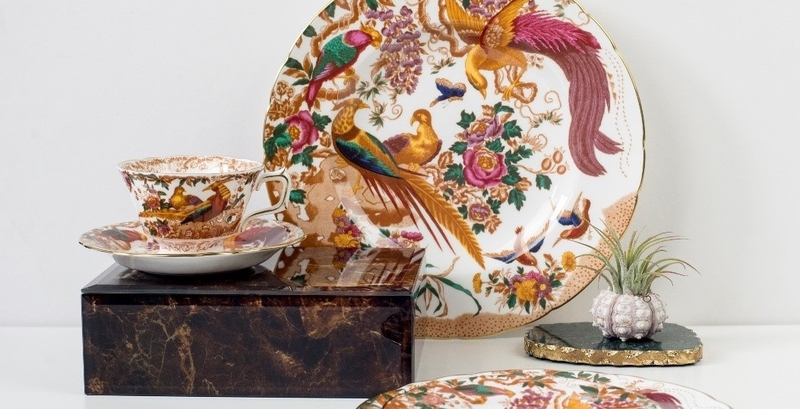 Royal Crown Derby have a stunning range of designs inspired by the seasons, why not take a look at a hand-picked selection of tableware designs for a summer inspired tablescape. The Olde Avesbury pattern features beautiful botanicals, dramatic birds of paradise and peacocks to create a statement design inspired by nature. Stunning rich tonal colours in shades of maroon, magenta, cobalt blue and regency green adorn this decedent print. 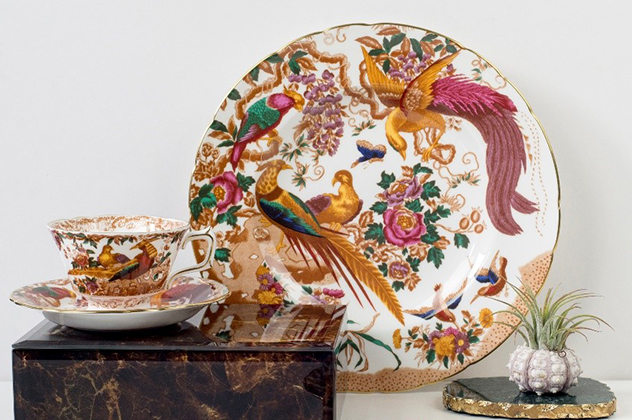 Edged in 22 carat gold adds a touch of luxury to the spectacular fine bone china pieces, creating a perfect statement dining experience inspired by flora and fauna. View Olde Avesbury tableware here. A mazarine blue design on pure white fine bone china makes the Grenville tableware pattern a perfect alfresco inspired table setting, a classic stylish theme for the season. This simple yet elegant design is perfect for everyday dining, finished with 22 carat gold to create a summer coastal table, for luxury alfresco dining. Take time for tea this summertime with sophisticated shades of pastel colour used in Royal Crown Derby’s Darley Abbey Harlequin surface pattern. 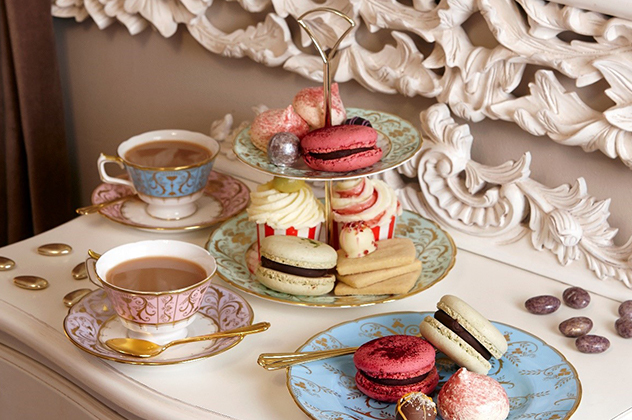 The design, inspired by an 18th century pattern from the Royal Crown Derby Archives adds a lovely charm to any afternoon tea setting, with 22 carat gold creating delicate lines and intricate designs of foliage and filigree leaves, adorn powdery pastel shades of baby pink, green, duck egg and lavender creates a classic tea setting. Mix and match to create a colourful and classic tea setting perfect to take tea alfresco this summertime on a stylish fine bone china setting. View Darley Abbey Harlequin tableware here. 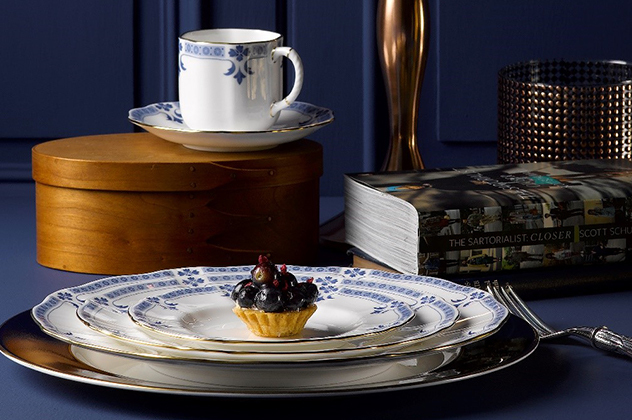 Royal Crown Derby have a beautiful collection of tableware patterns perfect for any season and taste, take a look at the full range by clicking here. Don’t forget you can get 10% off of your first order by using the code NEWUSER10.